The Argonaut has been closed since mid-July, but the club has been meeting at Liberty Tree, at 1016 H Street NE, in the meantime. Find out more on the club’s Twitter page. On a cool, overcast Friday evening, the Argonaut Running Club gathers outside the new patio bar of its namesake and sponsor. The club is a week past its six-month anniversary, and the weather has finally cooled, so the group is a little bigger than in summer. 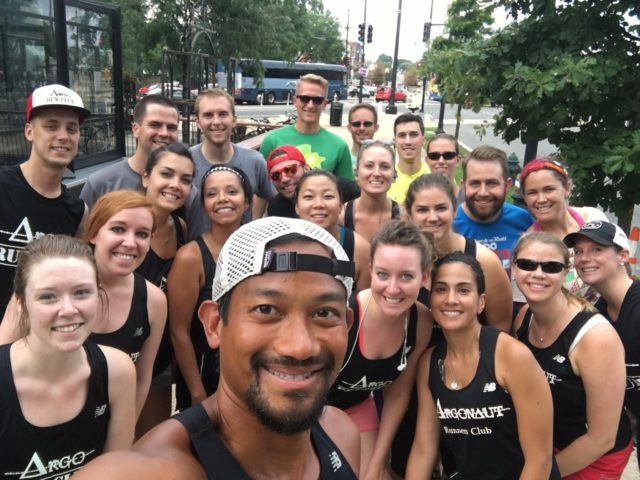 Several runners wear their Argonaut Running Club shirts, awarded after five runs with the group, and more ask about the trucker hats that are about to become available. Organizer Ariel Laguilles welcomes runners one by one, by name, asking about training or injuries and marking their attendance. “That’s the teacher in me,” he says, paging through his packet to a waiver that he asks me to sign. Runners introduce themselves to me, too: Leah, who has only run with the group once before; Marissa, Laguilles’s wife; Stephen, a colleague of Laguilles’s. Have I run with the group before, they ask. Do I live in the neighborhood? eavesdropping,” he admits. “I mean, I was alone.” But when co-owner Shaaron Pine asked his opinion, he floated the running club he’d been missing. The restaurant had become an institution in the neighborhood, rallying the community after a devastating fire five years ago. “It was a no-brainer having a brick-and-mortar spot to meet every week, a consistent time,” Laguilles says. “Every Friday at 6, everyone knows that we’re going to come and run, whether it’s two or three of us to 15, 16 of us, there’ll always be people to run with and then hang out, socialize with.” With some social media and signage around the bar, the club was born. It’s Friday evening after a challenging week. Working at a Catholic high school means Laguilles, Szolosi, plus Catholic University students Matt Gatti and Emily Thompson, have been caught up in the visit of Pope Francis. With the dozen others gathered, the group collectively eschews its four and six-mile routes for an easy two around the neighborhood. Pine snaps a group photo before we take off down Maryland Avenue. We settle into loose pace groups. The route itself is very nice: flat, mostly on brick sidewalks, stopped by few stoplights, and greeted by neighbors as we pass. “Whoa, Argonaut has a running group?” marvels a man walking his bicycle down G Street. Sara Betancurt agrees, commending Laguilles and his wife, Marissa McInnes: “They always remember you, they always say hi, they always ask about your day. They don’t forget you, even if you’re gone for three or four months.” She was part of a group from the club that ran the Capitol Hill Classic in May, where they debuted their team shirts, and she recently returned to the club after being injured. He dreams of a 5k or even a mile race in the neighborhood, maybe taking advantage of the nearby National Arboretum or Anacostia Riverwalk trail. “There’s tons of untapped potential in terms of running in this area,” he says. The Argonaut Running Club meets Friday evenings at 6 p.m. This originally appeared in the Winter 2015 issue of RunWashington. Tips on running to work in D.C.